Justin Haley took the checkered flag in Saturday’s NASCAR Xfinity Series race but Kyle Larson picked up the win. Coming to the checkered flag, Haley raced around Elliott Sadler and Larson but went below the yellow line to do so, which is forbidden by NASCAR rules at superspeedways. With Haley disqualified, Larson edged Elliott to pick up the victory in the Firecracker 250 at Daytona International Speedway. 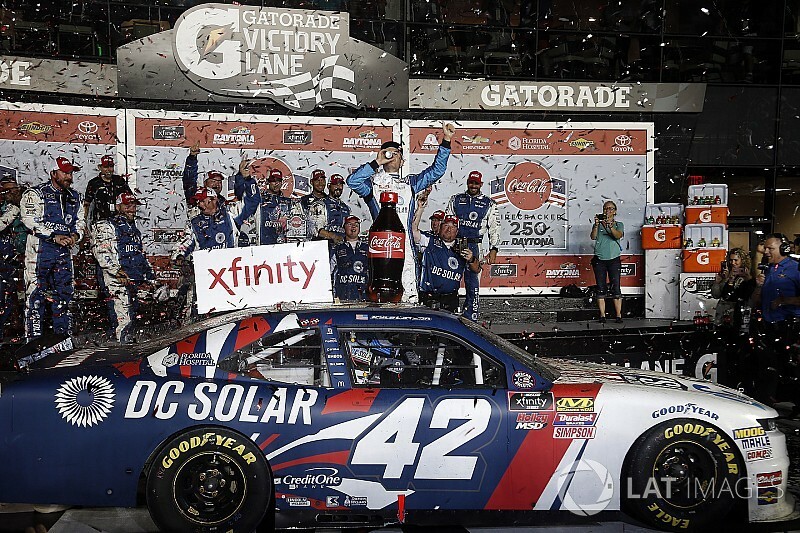 The win is Larson’s third consecutive in the series and third in just four starts this season. It was also the 11th of his career. “He had a massive run coming and turned left and did all he could to win and barely hooked the yellow line there,” Larson said of Haley’s end of the race move. The NASCAR rulebook states going below the yellow line is when the left side tires are beneath the left-line of the inside double yellow line. Haley’s No. 24 Chevrolet clearly did so in passing Sadler. “It’s really cool. I can’t say enough about this team, they bring great race cars every week to the track,” Larson said. Christopher Bell ended up third, Ryan Blaney was fourth and Kaz Grala completed the top-five. Haley ended up credited with an 18th-place finish. With 19 of 100 laps remaining, Matt Tifft got into Austin Cindric which triggered an eight-car accident. Cindric’s No. 60 Ford barrel-rolled about three times before coming to a rest on its tires. 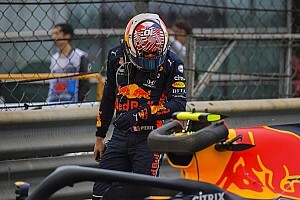 The race was red-flagged for several minutes to clear the track of debris. No one was injured. David Starr and B.J. 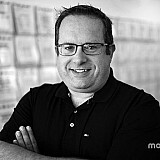 McLeod were disqualified for failure to adhere to the red flag. The race returned to green with 13 laps to go with Sadler in the lead, followed by Blaney, Elliott, Bell and Justin Allgaier. In Turn 3 on the restart, another wreck erupted collecting Ray Black Jr., Brandon Hightower and Chad Finchum. Under the caution, Chase Elliott – who was running third – took his No. 23 Chevrolet to the garage with a broken oil pump belt. On the restart on Lap 94, Sadler remained out front followed by Blaney, Bell, Allgaier and Larson. With four to go, Larson, Sadler and Blaney went three-wide for the lead with Larson coming away with the lead. With two to go, Jeff Green got into Cole Custer to triggered another multi-car wreck that sent the race into overtime. 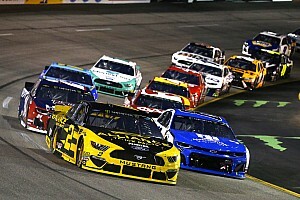 At the start of overtime, Larson held the lead followed by Allgaier, Sadler, Haley and Blaney. Larson worked feverishly to hold off Elliott and claimed the Stage 2 victory as Brandon Jones spun off Turn 4 on the final lap. Cindric finished third, Blaney was fourth and Tyler Reddick completed the top-five. Following a round of pit stops between Stages 1 and 2, Blaney was the first off pit road and took over the lead when Stage 2 went green on Lap 36. Bell spun into his pit box during the stops and also was penalized for a crew member over the wall too soon. He had to restart the stage from the rear of the field. Shortly after the restart, Cindric moved up to the second position. 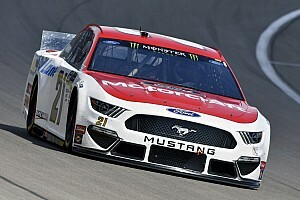 Halfway through the second stage, Blaney maintained a small advantage over Cindric, followed by Daniel Hemric, Sadler and Allgaier. With nine laps remaining, Ryan Preece pulled his No. 18 Joe Gibbs Racing Toyota to his pit stall with engine issues. “Something went through the radiator,” Preece was told by his crew chief, Eric Phillips. “We felt the motor go down and it was right when we were starting to go up there and start working the bottom. Motor sounded funny that last lap,” Preece said. “Changed pitch and I didn’t want to throw a grenade in front of the field and wreck everyone. Larson powered to the lead with three laps remaining as Blaney dropped back into the runner-up position. Larson held off Elliott with little problem to claim the Stage 1 victory. Sadler was third, Allgaier was fourth and Blaney completed the top-five. 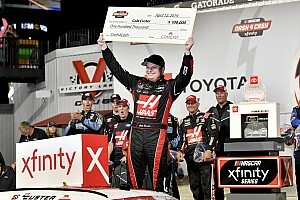 Cole Custer took early command of the race, leading the first eight laps before handing the top spot over to Larson. Halfway through the first stage, Larson continued to lead the way followed by Elliott and Sadler. With 10 laps remaining, Larson held a small advantage over Elliott. Sadler, Allgaier and Blaney were close behind. Michael Annett made a green-flag pit stop with three laps remaining and was able to remain on the lead lap until the stage ended. Five cars had to start the race from the rear of the field – Josh Bilicki (engine change), Ryan Reed, Jeremy Clements and Hightower (unapproved adjustments) and J.J. Yeley (missing drivers meeting).